Crescent University, Abeokuta [CUAB] Advanced Level Programme Joint Universities Preliminary Examination Board (JUPEB) Admission Form, Benefits, Admission Requirements, Duration and Application Guidelines for 2018/2019 Academic Session. 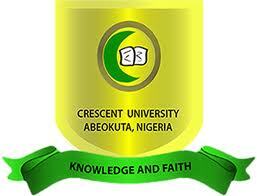 Crescent University, Abeokuta announces admission into Advanced Level Programme conducted by Joint Universities Preliminary Examination Board (JUPEB). Five O’ Level credits including English and Mathematics.